bein ded and all is boring. espesially sense snaps desn't hav a cuck nemore so iv ben plying werld pf wrcraft and legue of legends. wut do you do in ur freetiem? wel, since delly iz always spredin me and hur other bear white leg, i dont have much free tiem. but wen i do hav sum tiem, i enjoy classical music, drawing, reading, and dreming of becoming a profesional flutist. 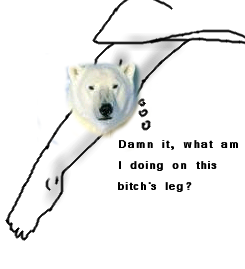 me and dumble's long white bear were frens, but we dont see each other much. it makes me sad.